A new presidential election forecast model (called the Time-For-Change model) projects that Obama has a good chance of being re-elected with a likely 52% of the popular vote. The Time-for-Change model has correctly predicted the winner of the popular vote in every presidential election since 1988. 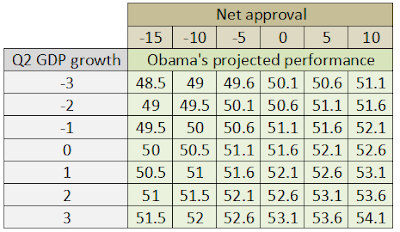 The model is based upon three factors: (1) the growth rate of the economy in the second quarter of the election year (Q2GDP), (2) the president’s net approval rating in late June or early July of the election year (JUNEAPP) and (3) the time-for-change factor (CHANGE), whether the president’s party has been in office for one term or two or more terms. The model predicts the incumbent party’s share of the major party vote (PV). CHANGE= zero if the president’s party has been in office for one term and one if the president’s party has been in office for two or more terms. Here are the model’s predictions given various values for JUNEAPP and Q2GDP. 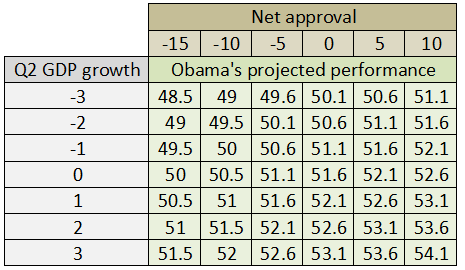 Bottom line: Obama has a good chance of winning provided neither his approval ratings nor the growth rate of the economy deteriorate much below their current level between now and the election.